The company plans to start testing its car service on Seattle streets this week. Lime operates bike- and scooter-rental services in more than 100 cities around the world, but Seattle will be its first foray into car sharing. Lime, the company that began life as LimeBike before branching out into scooters, is branching out again, preparing to launch a free-floating car-rental service in Seattle. The company plans to start testing its car service on Seattle streets this week. Lime operates bike- and scooter-rental services in more than 100 cities around the world, but Seattle will be its first foray into car sharing. Lime has operated bike shares in Seattle since the summer of last year, but the city has declined to allow the company (or any other company) to operate a scooter-sharing program. 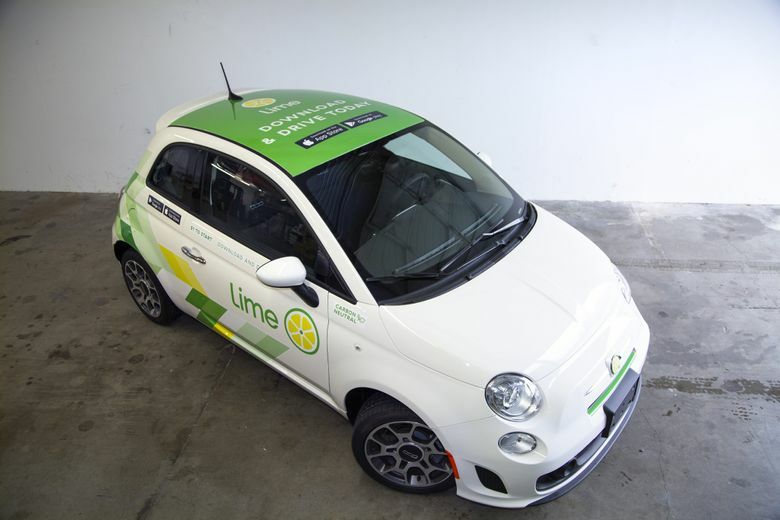 The cars — compact Fiat 500 Lounges painted in Lime-branded colors and patterns — will be spread around the city, available for users to unlock with Lime’s smartphone app. The company plans to have 500 cars on Seattle streets by the end of the year, and hopes to expand to 1,500 cars next year, in a program it has dubbed LimePod. The cars will appear as icons in the Lime app, alongside the standard bikes and electric bikes that now dot Seattle’s sidewalks. They’ll cost $1 to unlock and 40 cents a minute to operate, Demptser said. You can drive one outside the city of Seattle, but that 40-cents-a-minute tab will keep running until the car is returned and parked within city limits. They can be parked in any legal public-parking spot, Dempster said, including spots with paid parking. Lime’s permit fee with the city of Seattle, $1,730 per car, per year, covers prepaid parking fees, although the company will reimburse the city if its parking fees exceed that amount. Mafara Hobson, a spokeswoman for the Seattle Department of Transportation, said the company’s application has not yet been approved, but that the agency had no concerns. Since it launched as LimeBike (before renaming itself Lime last spring), Lime has touted itself as devoted to environmental sustainability. Expanding from pedal and electric-powered bikes and scooters to gas-powered cars would seem at odds with that mission. But Dempster says it is not. He cited research showing that free-floating car-rental programs lead to modest decreases in personal-car ownership. “We definitely believe very strongly that adding a car-share service is going to allow people to shed their private car,” Dempster said. In a 2016 study, the Transportation Sustainability Research Center at the University of California, Berkeley, found that a very small minority of Car2Go users either sold their car or held off on buying one because of the service, but that was enough to more than offset the increase in driving that results from the service. “Car2Go is on net reducing vehicles that would be owned by households, reducing driving, and thus lowering greenhouse gas emissions,” the study of five cities, including Seattle, found. Car2Go, the leading free-floating car-rental service, and ReachNow both operate similar services in Seattle. The two companies, owned by Daimler and BMW respectively, announced plans to merge earlier this year. Those two companies have about 1,500 cars in Seattle, combined.